Tells the picaresque adventures through the world of multi disciplinary artist and professional prisoner Tulse Luper. 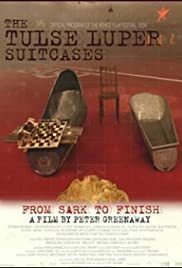 The Tulse Luper Suitcases is Tristan Shandy gone haywire - or Monty Python taken to even more absurd depths (my university English professor would be proud that I have remembered reading Tristan Shandy_ - The contents of the suitcases are revealed one by one : Suitcase number twelve : frogs. 92 Ways of Representing the World: #5 The bath. The number 92 is derived from the element number of uranium in the periodic table. Uranium - the purest of substances. Tulse Luper is a detailed clerk, devoted to minutiae and a interminable scribbler who writes to the edges. His writings are being typed up by a huge host of female typographists whose only job from 9 to 5 is to type everything up he ever wrote by hand in an effort by the stationmaster and party propagandist to decipher the intent of Tulse Luper - and moreover to discover if he is a spy. It is a multivisual experience with sights and sounds coming to you from all sides. This is only part 3 of an ambitious 16 part treatment of the history of Tulse Luper.